The first vaccine was developed by Edward Jenner in 1796 as a means of preventing smallpox. Currently, vaccines to protect us from around 27 diseases are available in the U.S., with more under development. 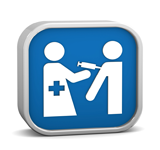 Immunization is the process in which vaccines are administered to help develop resistance or immunity to disease. In the medical community, immunization is generally considered to be one of the most important disease-preventing measures ever developed. Misunderstanding of how vaccines work and concern regarding their potential side effects, however, remains common among the public. Measles/Mumps/Rubella vaccine is responsible for causing Autism. Additionally, some people oppose mandatory vaccination believing that it is an infringement on their personal liberties. Invading germs, containing a substance known as an antigen, is recognized as being foreign to the body. This initiates what is known as the “immune response”. Specialized white blood cells called phagocytes (neutrophils and macrophages) swallow up and digest germs. Other white cells called B-lymphocytes recognize the antigen as being potentially harmful and produce antibodies that neutralize bacteria and viruses. T-lymphocytes, a third type of defensive white blood cell, attack cells in the body that have already been infected. Following the infection, lymphocytes (B cells and T cells) maintain an antigen-specific memory for the invading microorganism so that they can attack it even more efficiently the next time that it is encountered. That is why many infections, such as chickenpox, occur only once. Having had the infection, the body maintains an early surveillance system to prevent the same organism from causing a second infection. How vaccines work--- Immunization involves administering a vaccine, either by injection, orally or by aerosol in order to produce immunity. Vaccines are produced by killing or weakening a disease-producing germ. Examples of some of the best known diseases for which effective vaccines are available include polio, influenza, Hepatitis B, and pertussis (whooping cough). When vaccines are administered to someone who has not been exposed to the germ, they produce immunity by simulating an infection. Even though the vaccine is incapable of causing disease, it contains the same antigen as the disease-causing germ. This stimulates an immune response in the body just like when the immune system fought off a real infection. As a part of the immune response, the body is left with “memory” lymphocytes that remember how to fight the infection should actual exposure to the germ occur in the future. In part two of this series on vaccines, we’ll look at the effect that immunizations have had on our health. According to the American Academy of Dermatology, approximately 85 percent of the population will develop an allergic reaction if exposed to poison ivy, oak or sumac. The cause for the rash, blisters, and infamous itch is urushiol (pronounced yoo-Roo-shee-all), a chemical in the sap of these plants. Avoiding direct contact with the plants reduces the risk but doesn't guarantee against a reaction. Urushiol can stick to pets, garden tools, balls, or anything it comes in contact with. If the urushiol isn't washed off those objects or animals, just touching them--for example, picking up a ball or petting a dog--could cause a reaction in a susceptible person. The rash can often be recognized by its characteristic streaks of red blisters that are intensely itchy. The timing of the development of the rash and its severity depends to a large degree on the amount of urushiol that contacts the skin. If you are outside, but have access to water, thoroughly rinse the exposed areas of skin. As soon as possible, take a regular shower with soap and warm water. Although unproven scientifically, some people claim additional benefits from the use of a “poison ivy wash” such a Zanfel. Clothes, shoes, tools, and anything else that may have been in contact with urushiol should be wiped off or washed. Be sure to wear gloves or otherwise cover your hands while doing this and then discard the hand covers. If you don't cleanse quickly enough, or your skin is so sensitive that cleansing didn't help, redness and swelling will appear in about 12 to 48 hours. Since oozing blisters don't contain urushiol, the blister fluid is not capable of spreading the rash to another site on the body or to someone else. The rash, blisters and itch normally disappear in 14 to 20 days without any treatment, but few can handle the itch without some relief. For mild cases, wet compresses or soaking in cool water may be effective. Oral antihistamines, such as Benadryl can also relieve itching. Other, over-the-counter treatments that are safe and effective for temporary relief of itching associated with poison ivy include applying calamine lotion, taking oatmeal baths, and applying a topical corticosteroid cream (Cortaid, Cortizone 10, others). For severe reactions, particularly if the rash involves the face or skin around the eyes, medical attention should be sought for treatment with oral or injected corticosteroids. It is important to avoid scratching the rash since this could lead to the development of an infection. Also use of topical creams or sprays that contain antihistamines (e.g. Benadryl) or topical anesthetics (e.g. 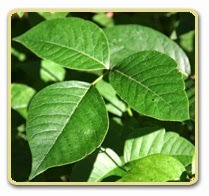 Lanacaine) can result in sensitization and the development of an allergic rash unrelated to the poison ivy. There are two primary ways of avoiding the development of poison ivy rash. The best preventive measure is avoidance of exposure to the plant. Remember the saying “leaves of 3, leave it be”. Those who are highly sensitive to urushiol should learn to identify poison ivy, oak and sumac in order to avoid the itchy consequences of exposure. It’s important to know that all parts of the plant, not just the leaves, are capable of producing the allergic reaction. Also, burning the plant can release urushiol into the air creating a risk for an allergic reaction in the airways or exposed skin. The second method involves protecting the skin against exposure. Although no longer on the market, IvyBlock, a lotion containing the chemical bentoquatam, was FDA approved for absorbing urushiol and reducing the likelihood of skin reaction. A second barrier method is to wear long pants, long sleeves, boots, and gloves when exposure cannot be avoided. It is estimated that approximately 80% of us will develop back pain at some point in our lives. The Agency for Healthcare Research and Quality, estimates that approximately 27 million Americans are affected by back pain each year. Misinformation and misunderstanding about back pain abounds. The following are a number of the “myths” surrounding back pain with “facts” to set the record straight. Myth #1: Bed rest is the best treatment for acute low back pain. Fact: Following an acute injury, a short period of rest, usually not more than a day or two, can help to settle down the pain and prevent reinjury. Too much rest, however, may stiffen and weaken muscles and joints and cause the pain to worsen. It's better to become active as soon as pain allows and initiate a gentle program of exercise to strengthen the back. Myth #2: X-rays and MRI scans are necessary for diagnosing back pain. Fact: The best tools for diagnosing back pain are the doctor’s history and physical examination. Most low back pain is due to “soft tissue” injuries, such as muscle or ligament strains, and these do not show up on x-rays or scans. To perform imaging studies on every person with back pain would be unnecessary and would generate needless expense. For specific indications, however, such as back pain following a severe injury, imaging studies should be performed. Myth #3: Back pain caused by a herniated (“slipped”, ruptured, etc.) disc requires surgery for relief. Fact: Only 10% of people with symptomatic herniated discs undergo surgery. Approximately half will recover after a month and another 40% will get better within 6 months. Surgery is appropriate for people with certain problems such as persistent leg weakness, urinary incontinence due to nerve compression, or limitation of daily activities. When all causes of lower back pain are considered, less than one person in 1,000 will need surgery. Myth #4: Low back pain is most likely to affect those with physically demanding jobs. Fact: Sitting applies more pressure on the discs than standing. Those with sedentary jobs involving long periods of sitting may place more stress on their back than those who work on their feet, even if the job is physically demanding. The risk of injury can be reduced somewhat through attention to office ergonomics and taking regular stretch breaks. Jobs involving heavy lifting, particularly when poor lifting mechanics are used, do increase the likelihood of developing low back pain. Myth #5: Having chronic back pain means that you should curtail your physical activity. Fact: Numerous studies have demonstrated that performing appropriate exercise is highly beneficial for those with chronic low back pain. This program should include aerobic exercise to condition the heart and larger muscles, a strengthening program, particularly for the abdominal and lower back muscles, as well as a stretching program to maintain flexibility. Myth #6: Most low back pain is caused by disease affecting the discs. Fact: On the contrary, most low back pain is triggered by injury to the supportive structures, e.g. muscles and ligaments. Millions of people seek medical attention each day for low back pain, however, less that 5% of these will have low back pain caused by a herniated or slipped disc. Myth #7: Cigarette smoking has no bearing on the development of low back pain. Fact: A number of studies indicate that smoking is a leading risk factor for the development of degenerative disc disease, a major cause of lower back pain in older individuals. The reasons for this may have to do with the toxic effects of nicotine on the intervertebral discs or the fact that many smokers have a sedentary lifestyle. Research has also shown that smokers who quit report greater improvement in back pain than people with back pain who continue to smoke. 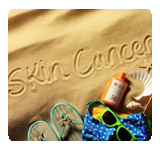 Skin cancer is the most common form of cancer in the United States, occurring in over two million people each year. Three of the most common types of skin cancer are squamous cell carcinoma, basal cell carcinoma, and melanoma. Last week, characteristic features of each of these were described in order to help alert you to the possibility that you may have developed a skin cancer. This week we’ll look at how these common forms of skin cancer are treated and learn how to reduce your risk of developing skin cancer.